A Reality Check in SF! You may think that everything is going crazily over the asking price in San Francisco. But, if you take a look around, there are some nice properties that are not selling quickly and are sitting on the market longer. Today in SF, if a property doesn’t go into contract within 2 weeks or sooner, the listing agent and seller get nervous. Looking at properties that are on the market for more than a month may provide some opportunities. On my recent Broker’s Tour, I saw a lovely 3 bedroom condo in the north end with nice finishes and a view deck. As I walked in, I heard the listing agent speaking with some other agents about their thoughts on whether or not he should reduce the price. It had been on the market over 30 days. They had mixed views about reducing the price. One of them thought the market was slowing and reducing the price might not bring about the listing agent’s hope for multiple offers. But at this point, the listing agent felt he had to do something. A quick look at some neighborhoods for properties on the market for over 30 days reveals 3 condos and 5 homes in Pacific Heights that haven’t sold in under 30 days. 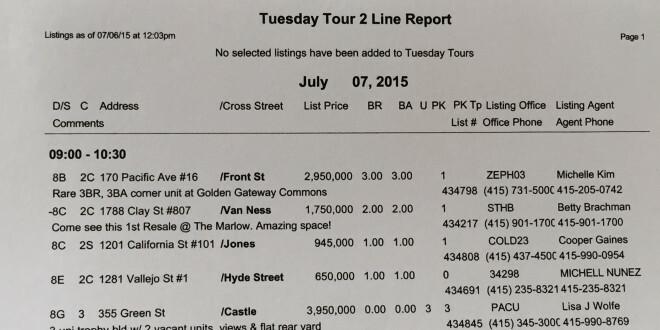 There are 3 condos and 3 homes in Noe Valley, with one home on the market already for 75 days. In Russian Hill there are 2 condos and one home on the market for more than 30 days; the home has been on for 135 days. Clearly, everything is not selling as soon as it hits the market and going a gadzillion dollars over the asking price. For buyers who want to get into the market and potentially not be involved in a multiple offer situation, focusing on properties that have been sitting on the market for over 30 days may help them finally find a place they can afford. Previous: So You Think That Offer is Non-Contingent! Next: When a Property Sells Substantially Below Asking In a Hot Market!